FourFriends Wild Boar & Turkey is is totally gluten and grain free. 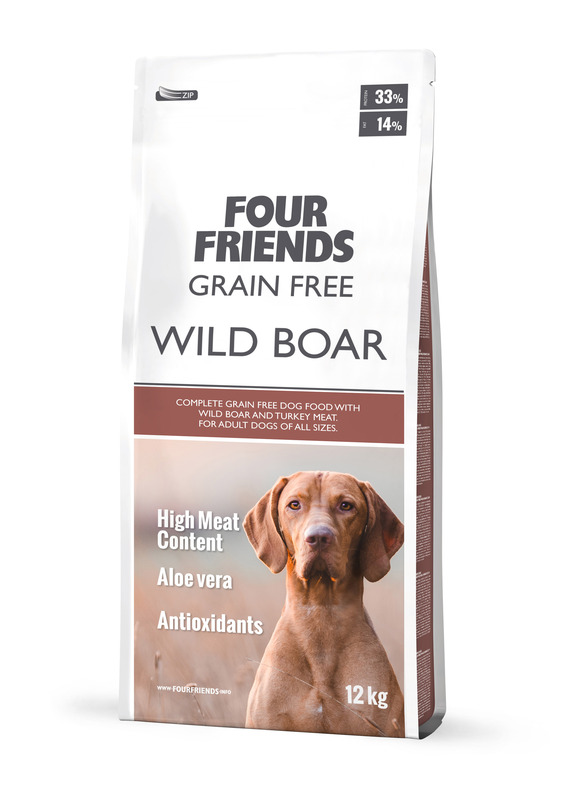 Made with pure wild boar & turkey meat helps contribute to excellent body condition. We use potato flakes as the sole carbohydrate source. Wild boar and turkey meat gives an excellent taste sensation and palatability..
Wild Boar meat meal 25%, potato flakes, peas, protein chicken fat (preserved with mixed Tocopherols), turkey meat meal 10%, dried apples, pea protein, brewer´s yeast, hydrolyzed poultry liver, salmon oil, aloe vera (1,5 g/kg), fruit & herbal extract, mannan-oligosaccharides, fructo-oligosaccharides, yucca schidigera extract, green lipped mussels, blueberries.